Prezi is an online presentation editor that enables you to create unique and visually stunning presentation that will without a doubt make you forget about your previous attempts to make “normal” presentations in PowerPoint and similar high-end programs. Prezi does not use the concepts of pages, but instead gives you ability to create one giant wall filled with data, vector graphics and animation. When you start your presentation, camera will zoom in and out from the giant wall of your data, presenting viewers with unique camera views to specific area of your wall that can be decorated with interesting graphics and vector animations. This stunning presentation is truly different from any previous ways building presentations, no matter what theme you want to showcase. 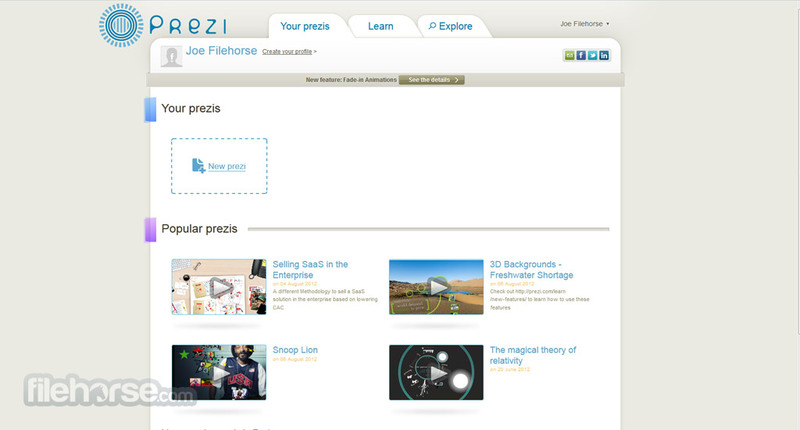 Prezi is unique, free, innovative, and it runs directly from your browser. What more can you ask for? Great online presentation editor maker! Creating presentations something that every businessman, worker, designer, marketing expert, student and even home users does, sometimes n regular basis and in rare cases even daily. Users who have tried to create presentations, present them in front of live audience or distribute them online to users who have several device form facts know how various things can reduce attention of end users, pulling them away from the content that is presented in front of them. To combat this developers from studio house Prezi have created a tool that aims to give power to everyone (and especially companies, teams and educators) who wants to keep audience focused on content that is showcased in front of them. Originally launched in April of 2009, this app managed to achieve tremendous success by offering visually striking presentation editor that can craft semi-3D content with ease. 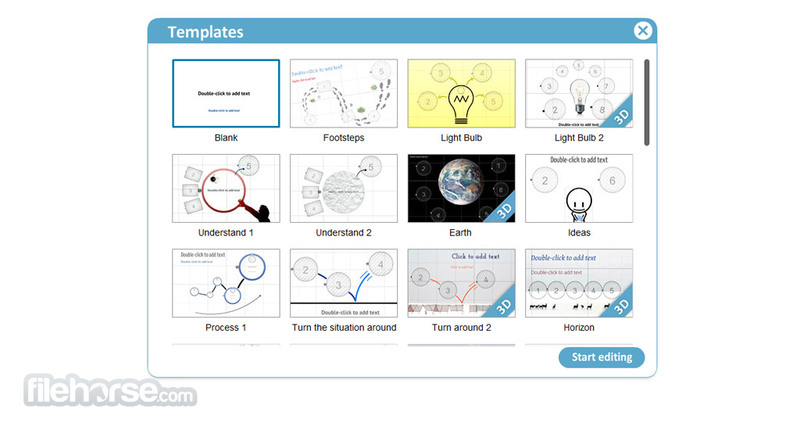 Prezi is a presentation editor based fully on web tools that enable home users, professionals and teams of all sizes with easy way to create visually stunning presentation what will easily elevate your talking points, make people who are watching your presentation more opened to retain data you are showcasing and enable users of all technical and design levels to create eye-catching presentations that will not easily be forgot. Great online presentation editor maker! The visual approach that Prezi has chosen to employ is very unique, focusing on creating presentations on a big white board that features color rich backgrounds and as many visual elements that you can place on that board. The presentation itself will zoom in and out across that board, enabling you to zoom in to the fine points of your data structure where you can list and showcase anything you want, while simultaneously providing your viewers easy way to spot the overall structure of your talk and concept you are describing. By focusing on that visually striking approach to presentation flow, users have very unique ability to distinguish their presentations from others created with standard editing apps like PowerPoint or Google Docs who are more focused on standard transitions. Differences between support for home and professional users are noticeable, with paid users getting the chance of created private presentations, offline support for Windows and Mac, personalized branding, commercial billing management, collaboration tools and larger online storage. With support for all modern home computer systems and portable platforms, Prezi is a tool for everyone. Prezi has very bright and appealing user interface, which promotes good navigation, easy editing suite and quick access for tools that manage presentation library, promotion, sharing and collaboration. New users will have little problem to get accustomed to the way Prezi works, but veterans of older editor (for example PowerPoint) will need to spend a little time getting accustomed to the totally different concept of editing and creating finalized presentation. Wide array of text and video tutorials is present to make novices feel more welcomed. Free version of Prezi gives users ability to create unlimited amount of public presentation (alone or in collaboration) with 100 MB of online cloud storage. Premium versions start with $4.92/month and go up to $13.25/month. The most comprehensive account tier is for Teams, which unlocks all tools and remove all limitations, although its price is not disclosed. Prezi makes creation of incredibly good looking presentations like an easy thing to do, which is precisely why it has become so popular not only with general audience but also 80% of the Fortune 500 companies who have implemented Prezi into their presentation pipeline. Awesome online presentation editor maker! 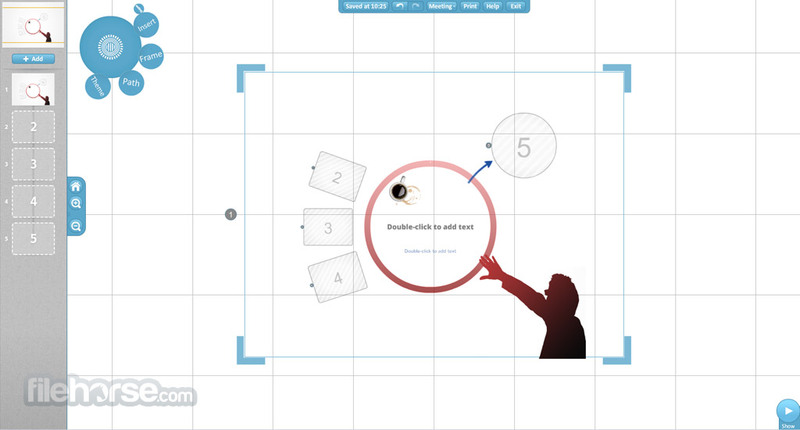 Zoom around the prezi canvas to visualize your ideas. View, retouch and present your prezis from your iPad. Use frames and a path to create a cinematic journey.